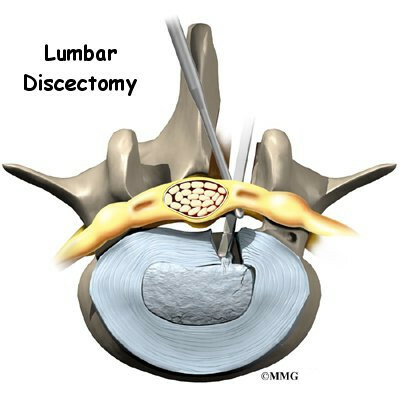 Lumbar discectomy is a surgical procedure to remove part of a problem disc in the low back. The discs are the pads that separate the vertebrae. This procedure is commonly used when a herniated, or ruptured, disc in the low back is putting pressure on a nerve root. What parts of the spine and low back are involved? Surgeons perform lumbar discectomy surgery through an incision in the low back. This area is known as the posterior region of the low back. The main structure involved is the intervertebral disc, which acts as a cushion between each pair of vertebrae. The two main parts of the disc are the annulus and the nucleus. The lamina bone forms the protective covering over the back of the spinal cord. During surgery, this section of bone is removed over the problem disc. The surgeon also checks the spinal nerves where they travel from the spinal canal through the neural foramina. The neural foramina are small openings on each side of the vertebra. Nerves that leave the spine go through the foramina, one on the left and one on the right. Lumbar discectomy can alleviate symptoms from a herniated disc in the low back. The main goal of discectomy surgery is to remove the part of the disc that is putting pressure on a spinal nerve root. Taking out the injured portion of the disc also reduces chances that the disc will herniate again. These goals can be achieved using a traditional procedure, called laminotomy and discectomy, or with a newer method called microdiscectomy. The traditional method requires a larger incision and tends to require a longer time to heal. Microdiscectomy is becoming the standard surgery for lumbar disc herniation. Since the surgeon performs the operation with a surgical microscope, he or she needs to make only a very small incision in the low back. Categorized as minimally invasive surgery, this surgery is thought to be less taxing on patients. Advocates also believe that this type of surgery is easier to perform, prevents scarring around the nerves and joints, and helps patients recover more quickly. Discectomy surgery is usually done with the patient kneeling face down in a special frame. The frame supports the patient so the abdomen is relaxed and free of pressure. This position lessens blood loss during surgery and gives the surgeon more room to work. 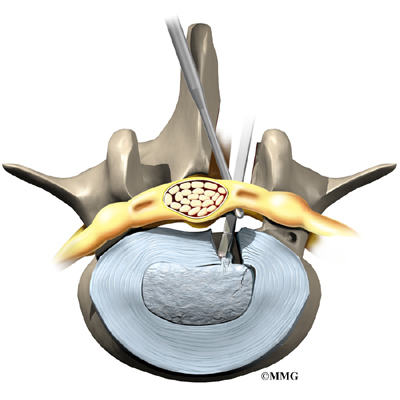 Laminotomy and discectomy is the traditional method of removing the disc. 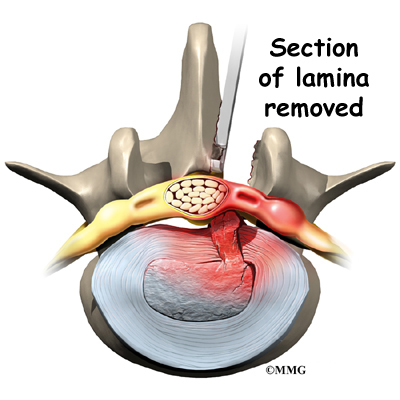 Laminotomy is taking off part of the lamina bone (the back of the ring over the spinal canal). This allows greater room for the surgeon to take out part of the disc (discectomy). An incision is made down the middle of the low back. After separating the tissues to expose the bones along the low back, the surgeon takes an X-ray to make sure that the procedure is being performed on the correct disc. A cutting tool is used to remove a small section of the lamina bone. Next, the surgeon cuts a small opening in the ligamentum flavum, the long ligament between the lamina and the spinal cord. This exposes the nerves inside the spinal canal. The painful nerve root is gently moved aside so the injured disc can be examined. A hole is cut in the outside rim of the disc. Forceps are placed inside the hole in order to clean out disc material within the disc. Then the surgeon carefully looks inside and outside the disc space to locate and remove any additional disc fragments. Finally, the nerve root is checked for tension. If it doesn't move freely, the surgeon may cut a larger opening in the neural foramen, the nerve passage between the vertebrae. Before closing and suturing the wound, some surgeons will implant a special foam pad or a piece of fat over the nerve root to keep scar tissue from growing onto the nerve. Some surgeons also insert a small drain tube in the wound. The surgeon performs microdiscectomy using a surgical microscope. A two-inch incision is made in the low back directly over the problem disc. The skin and soft tissues are separated to expose the bones along the back of the spine. An X-ray of the low back is taken to ensure the surgeon works on the right disc. A retractor is used to spread apart the lamina bones above and below the disc. Then the surgeon makes a tiny slit in the ligamentum flavum, exposing the spinal nerves. A special hook is placed under the spinal nerve root. The hook is used to lift the nerve root, so the surgeon can see the injured disc. Next, the annulus (outer ring) of the disc is sliced open. Material from inside the disc is scooped out to ensure the disc doesn't herniate again. Since only the injured portion is removed, the disc is left intact and functioning. Then the surgeon inspects the area around the nerve root and removes any loose disc fragments. Finally, the nerve root is gently wiggled to make sure it is free to move. If it can't move, the surgeon also cleans around the neural foramen, the nerve passage between the two vertebrae. When the nerve moves freely, the muscles and soft tissues are put back in place, and the skin is stitched together. This is not intended to be a complete list of possible complications. Discectomy is especially helpful for patients whose main complaint before surgery is leg pain. When back pain has been the main complaint, however, surgical results vary. If the pain continues after surgery or becomes unbearable, talk to your surgeon about treatments that can help control your pain.